Mainly due to digital photography, we hardly ever print the photos that we take, and we have to view them on our computer, mobile phone or television. The habit of filling photo albums with our favorite pics has been lost, but thanks to Fotoprix PhotoBook we can now create albums with professional quality from the images that we have stored on our hard drive. 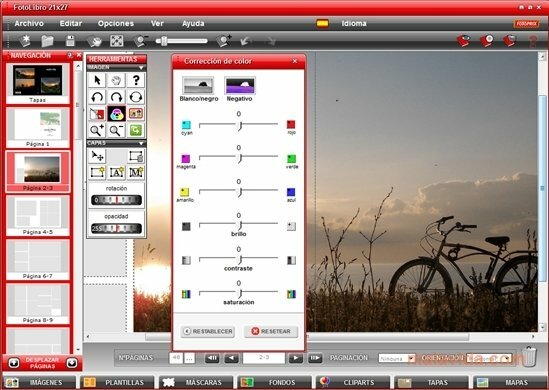 The application has an intuitive interface from which we will only have to choose the kind of project that we want (photo book, calendar, album, visiting card or greeting card), the design and size, so that after that we only have to "Drag&Drop" the images we want in the free boxes, readjusting the size and the orientation of each photo, to complete our work. Once finished, the program will propose an estimate indicating the exact price to print and bind our work, allowing us to make some last minute changes if necessary. If you want to transfer your images and photos to a professional quality album, download Fotoprix PhotoBook right now.